Wwoofers Uncovered In the Southern Wairarapa ! A couple of weeks ago we featured the “Good Life Trail” put on by Wairarapa Organics and there I encountered my first Wwoofer. Now this got my curiosity stirred – what on earth is a Wwoofer? Some of you may know but having spent a few too many years in cities I had no idea what Wwoofers are. John Little informed me, “Willing workers on Organic Farms.” So I set out to Heather and Ian Atkinson’s farm at Pirinoa in search of some of these elusive Wwoofers and there I found not one but two of them. Now a little about the two Wwoofers I found at Pirinoa. John Little hails from Alaska where he has retired from a teaching career in technical subjects and brings his wealth of knowledge to earn his keep. At 69 years of age John is a father of three boys and a grandfather of six. John discovered the life while reading Lonely Planet and from an American teacher friend living in Nelson who knew the fella who started Wwoof. John sent off $10.00 for the guide book that also serves as a registration document. When the book arrived with notification of a price increase John sent off the extra $5 but was left touched by the trust of sending the book out anyway. John has been coming out to New Zealand for a few years now and spends several months here each visit. Beats the winter in Alaska I guess! On phoning the Atkinson’s a deal was struck and a great friendship has grown. His skills are well used at the Atkinson’s fixing fences, repairing the stockyards, fencing the garden and making some handy stools. At other places John has remodeled buildings, pruned tress and gardened, you name it and John can probably do it or more likely has done it, with his biggest pleasure just sharing his knowledge and experience. This trip started at a farm near Taupo and after the Atkinson’s another farm will host this bubbly yank, each farm is visited for usually two to three weeks with a minimum stay of a week. Twenty-five year old Sally Truelove from Devon, England also finds the Atkinson’s a happy household to be a part of for a visit. Sally has taken time out from her job as a crop analyst at Riverford Organic Vegetables. She is traveling for six months to see some new sights and learn of organic experiences in other countries as a fun way of expanding her skills and knowledge. This will be put to valuable use when she returns to Riverford as they operate the largest organic vegetable home delivery service in the U.K. with 30,000 boxes of produce going out each week. 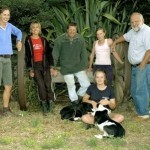 Sally stayed at the Atkinson’s for only a week before heading to the South Island to a dairy farm for two months. While there John was ready and willing to pass on a few of his carpentry skills to Sally as she assisted with fencing and the famous stool making. Sally also milked cows, was this what the stools were for?? I think not !! The Atkinson’s are one of many Wwoofing hosts in the our region and their warm Wairarapa hospitality provides a great way for our community to gain much knowledge and experience from around the world while providing a wonderful cultural exchange. Thanks to the Wwoofers and their kiwi hosts for sharing your experiences, knowledge and life. Check out this exciting new “MyWWOOF” feature – it’s really interesting to read more about WWOOFers, where they have come from, what their interests and aims are. Search hosts can now look for WWOOFers. Search for a name, membership number or a particular skill. Photo Gallery Hosts can now upload their own photos to create an online gallery that WWOOFers can view while searching for a host. Along with the written description of the property, photos give a good idea of what the property is like. WWOOFer Profiles WWOOFers can write a personal introduction, say what skills they have to offer, where they have been WWOOFing previously and if they have any special diet requirements. This helps hosts find the most suitable WWOOFer. P.S. Don’t worry if you don’t have the internet, WWOOF is still printing the WWOOF Book and mailing “old fashioned” letters! Thank you to Peter and Pete from opening up your home and property for this gathering. Everyone enjoyed your beautiful Autumn Farm, the company and great organic food, wine and beer – all locally grown, vinted and brewed! It’s always good to hear about WWOOF from others, the funny stories, common challenges and advice for making the exchange more successful. As it turned out, an expert WWOOFer had turned up – 26 WWOOF Farms and still going strong! To the Wwoof Management, in Drumgor Estate, Awanui I have digged up a blackberry root, 134 cm long. Guinessbook of Records can be jalous. Do they have that item in their book? You have it and you can ask the WWOOFers who can do better. You are allowed to publish this in the next cultural Exchange Magazine, of which I should be very proud. Good going Hetty! Thanks for all your help getting rid of the weeds, it sounds like you had a good time WWOOFing in New Zealand. Jane. To all who may doubt the power of wwoof,which has stood for many things over the years (I prefer the original) us wwoofers join, then willingly go to work on Organic farms, thats it!! If opportunities arise once there-fine! Anyway from my latest adventure as a wwoofer, (my 15th year) I have renamed it again.. Working Wishes Only Organicly Fullfilled. Which for me and more so the host in New Zealand, was exactly that! The doubters for me over the years have been mainly the imigration/goverments of different countries, they have no idea,not a clue how wwoof and others like it can bond people of all walks of life together,the culture sharing, or just careing, without money,power, or the fear of war to create a demorcracy. The following tells a brief story of how this can be done through wwoof. On some big, big farms help by wwoofers can easily and quickly be forgoten,for a line often heard from hosts, is, “the world now comes to us” So us wwoofers are sometimes not just willing workers, but entertainers, we can liven things up a bit, a new face to have around for the hosts, and if we weren’t there, then the eggs would have been collected anyway,that fence fixed eventually,the weeding completed. But for me this time in New Zealand, far from it! Julie Rileys farm consisted of 2 pigs, (which one of them actually sat when you asked it to before feeding) 2 parakits, 3 4×1 meter very weedy vege beds, a slowly disappearing mix fruit orchard,where to get down to it one would slip,slide and struggle down a steep bank,some kiwi and grape vines,a collapsed compost bin. Some farm you may ask, but the location on the Banks Peninsula hugging the East coast of the South Island, 30 minutes from the wonderful city of Christchurch was a dream haven, which was the name of Julies farm, and no better name could it be. I chose this place because of the simplicity of the write up, with no dangling carrots to tempt you there,and some kind of energy that I have experienced many times before, pulling me and telling me to get there! “Dream Haven” for Julie was becoming just that, a dream of wishes that her garden/orchard, which nature was slowly taken back, would be one day, back as it once was before. Enter Wwoof and James!! The dream for me was being in New Zealand, a dream I have had many times while in my caravan, my base in the Highlands of Scotland, (although born in East London) You see, organic vege growing,garden maintenance/landscaping is what I do in Scotland from March to November, then I travel. Julies wishes and dreams were about to come true, she was asking for help–real help! Julie met me off the bus, which stopped just for me at the Blue Duck Cafe, and over good coffee we hit it off, and then set off to her place. To my surprise I was her first ever wwoofer! !, wow, I have never arrived on a farm to be the first wwoofer before, quite an honor! My home for the next few weeks I can see will be a wee caravan sitting in the flower beds, perfect just like home. Julie shows me around, while explaining about her health,dreams, wishes, one, as we tumble down, being steps down to the suffercating orchard she would like to see breath again, more vegies to grow once the beds are weeded, prunning, a new compost bed and area would be good. She says, “what do you think?” I say, “well did you get my second email explaining what I do? “No” she says, only the first one with dates and times etc., So I say all that you have shown me, plus your wishes and dreams is what I do! And before I go it will all be done, “Kumamatada” (lion King) I cant actually wait to get stuck in! And so it was, all done, including the steps, which now run down to the now breathing orchard, which included a grand opening of cutting a vine, which I bonded together with daffodills,roses,and daisies for Julie to cut, and to be the first one down them! So no huge farm with deadlines on picking salads for the local hotels etc., no veges or fruit to be harvested for the vege box business, no odd jobs that would be done anyway (here they would not have been done) But simply wwoof help for someone who passionatly needed it for her own comfort,joy and the love of nature and her garden. Its not thank you James, its thank you Wwoof , Willing Workers On Organic Farms. If you want to stop being a tourist and experience what it is really like to be a local member of the community, join and support the local WWOOF group. Along with other WWOOF organisations, WWOOF New Zealand is involved in helping new WWOOF organisations to become established. An information pack is available along with tech support with websites, databases etc. As you know, we have been involved in helping WWOOF France get going. Recently been been working with Harish from SEWAK who is in the process of setting up WWOOF India, they hope to launch August 15-Independence day in India. Good luck. We have had some contact with people from Kazakhstan, Ireland and South Africa who are also interested in the idea of national WWOOF organisations in their countries. We will let you know how this progresses. Thank you to those who have contributed to this newsletter. We can see by the articles above and the interest in new WWOOF groups that the spirit of WWOOF is working well and spreading.